Property Size 1,565 sq. ft. 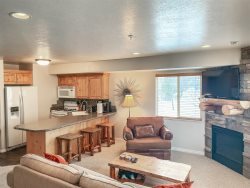 This incredible Moose Hollow #810 is a beautiful 3 Bedroom / 2.5 Bathroom Luxury condo located in Eden, UT in the beautiful Ogden Valley and Wolf Creek area. Located 15 min. from the World Famous Snowbasin Ski Resort and 10 min. below Powder Mountain, two of Utah's VERY BEST Ski destinations! This upper condo unit is loaded with great features and comforts for your family vacation. Luxurious leather couches (one is a pull out sleeper if you need a little extra room) and very comfortable beds, with brand new linens throughout! Two Fireplaces including master with King sized bed, flat screen TV, upgraded Jacuzzi bathtub. The kitchen has bar dining for 4 as well as table dining for 4 and is completely equipped. ** Well appointed Kitchen with many small appliances including all dishes, silverware, pots / pans, everything you'll need. Appliances are all top of the line, black finish, marble counter tops. Double Oven, Full size Refrigerator, 4 burner Stove, Microwave, Dishwasher, all Dishes & Utensils included, Coffee Maker, Toaster, Toaster oven, mixer, crock pot, mini food processor and even a pancake griddle! Beautiful mountain views from front balcony and back patio! Golf: Located adjacent to the Wolf Creek Golf Course! Pool / Spa Communal Pool year round Hot Tub - 2 Hot tubs - pool closed during winter. Amenities nearby: ATM/Bank, Groceries, Massage Therapist, Fitness Center, adventure center, Golf Course. Leisure Activities: Photography, Scenic Drives, Walking, Boating, Sledding, Wildlife Viewing, Horseback Riding, Mountain Biking, Fishing, Golf, Skiing, Snowboarding. You won't be disappointed and will want to return year after year. Thanks for looking at Moose Hollow 810. Perfect weekend getaway! We would love to come back and stay again. Stunning views of the valley. The beautiful condo was comfortable in every way for our two small families. We really enjoyed our stay at this property! I commented to my husband that when we stay in hotels we usually dont sleep very well, but in this condo we sleep wonderfully! Everything that we needed was available, the furniture and beds were comfortable. The building is the farthest from the swimming pool, so its quieter than other units. I loved that there was a stream behind the balcony and opened the door in morning to listen to it and other nature sounds for some quality meditation and relaxation. Ill put this property on my favorites! Beautiful and spacious Mountain retreat This was definitely a beautiful condo! My family and I had plenty of room and had plenty of dishes and towels which a lot of places seem to lack on. The views were spectacular from the balconies. Everything seemed to be pretty easy to find and use plus everything worked! We would not mind staying here again in the future!